My second holiday gift guide this season focuses on fashion! (See my beauty gift guide here.) If you're shopping for the fashionista in your life, I know it may be tough to figure out what the perfect gift is. Fashion changes every day and each person's tastes are different. I've been scoping out some of the most popular trends this season and I've rounded up a few, affordable trends that are sure to please the fashion lover in your life. So if you're not sure what to get your favorite fashionista, don't worry. I got you! The great thing about these items is that they are all under $100! In fact, most items are under $30. 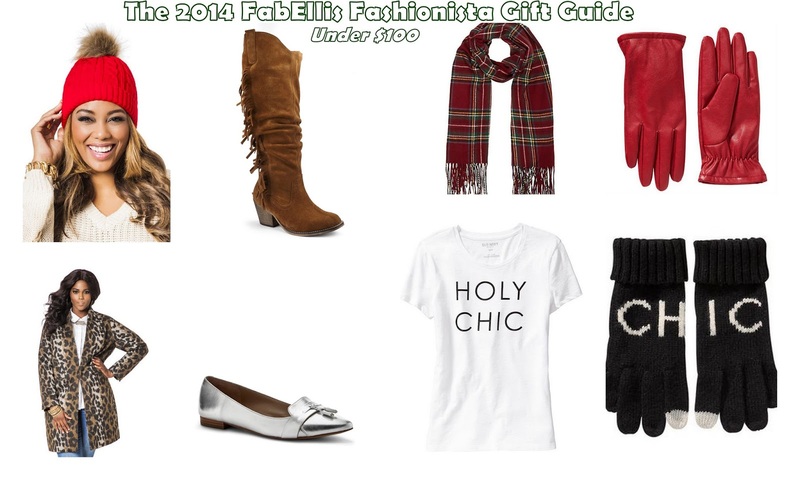 What's your favorite item in this fashionista gift guide? What fashion piece would you love to receive this Christmas? Oh, I would love to have those fringed boots! I would love to have them all, especially the Holy Chic shirt. Aren't they so cute?! I loved them when I saw them. Thanks for checking out my gift guide! Happy Holidays! You'll love that shirt! Never goes out of style! Thanks for checking out my gift guide. Happy Holidays! I loved those boots instantly when I saw them! Great minds think alike. :-) Happy Holidays! Those are some really cute and practical gift ideas. Thanks for sharing! I would love to receive any dress from Ashley Stewart. I already own two dresses from them and it wouldn't hurt to own more. Love the silver shoes! I had a pair of those growing up and I could not get enough of them. love the hat and boots! i love your gift idea choices! I love their dresses! They are having a great sale right now! Thanks Mark! Thanks for checking out the gift guide! I own the silver pair myself and they are so fun! Thanks for checking out the gift guide Lysha!